What do you do when one errant throw leads to another… then another… then another? More importantly, what do you think about when you make a string of throwing errors? Most likely, it gets in your head and you start thinking about what might happen on your next throw or you try to talk yourself through the mechanics of the throw. This overthinking is at the root of the throwing yips. You may try to walk yourself through the throw in your mind and guide the ball to the target. This overthinking causes your physiology to change. Increased muscle and mental tension, changes your release point. When your release point changes from throw to throw, your results become inconsistent as well. You haven’t forgotten how to throw the ball or suddenly lost your ability to make accurate throws. It is your conscious thought is interfering with your mechanics and causes you to yip. The reality of the yips have motivated researchers to delve into the problem to study the process of the yips. In one study, Leiden University scientists Bruno Bocanegra and Bernhard Hommel examined the difference between exerting mental control (thinking yourself through a throw) and being on “autopilot” (just reacting and unconsciously throwing the ball). Bocanegra and Hommel determined that thinking about performance in the middle of performing a relatively routine activity impaired performance and could cause the yips. In baseball terms, when you think about throwing the ball in the middle of a game (a routine activity that you have repeated thousands of times over the course of years), you throws become less accurate. Mental effort is not needed to throw a baseball. It is already a habit you have formed through repetition. Rick Ankiel, Life Skills Coordinator for the Washington Nationals understands the mental side of baseball and how the yips can affect a player’s career because it altered the course of his career. Ankiel was a top left-handed pitching prospect for the St. Louis Cardinals before developing a debilitating case of the yips. Ankiel lost command of his pitches so badly that he was reassigned to the minor leagues and never regained his pitching form. To Ankiel’s credit, he reinvented himself as an outfielder, made it back to the big leagues where he played from 2007 to 2013. Now, Ankiel teaches players effective mental skills in order to perform optimally on the field. If you learn how to manage adversity and anxiety, you can take charge of your game and overcome the yips. 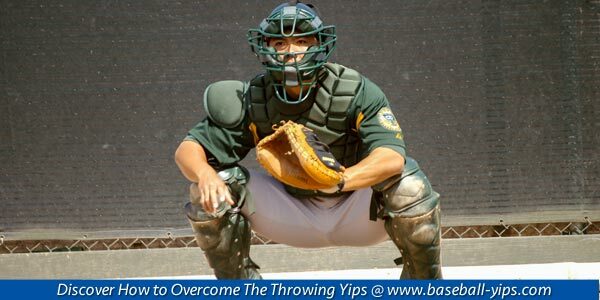 The most important thing to realize is that your thinking either contributes to the yips or combats it. One double clutch or throwing error is not an indication of bad things to come unless you allow your mind to run wild. Clear your mind. The great thing about baseball is that there will be another pitch and another opportunity to make a play..